Their reasons for hating running vary, from boredom, to complaints about muscle loss, and how they feel running is not effective for weight loss. While I understand these complaints, running still has a special place in my heart and will always be a part of my fitness regime, in one way or another. What brought this topic up for me this week is that I read two articles that both talked about the mental benefits of exercise: one about lifting and the other about running. It was interesting reading them both in the same week, and identifying with each. Let me explain. 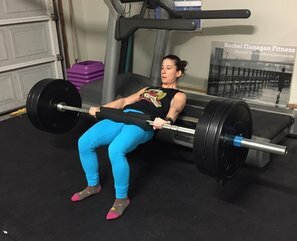 ​Weighlifting and running both bring me joy. But lifting has brought out a level of confidence that was largely untapped before I started lifting seriously. There is something about walking up the barbell, loading on heavy plates, and then lifting said bar, either up from the floor in a deadlift, up from your chest on bench press, or over your head in military press, that makes me feel like there’s nothing I can’t conquer. When I hit a new record on a lift, like I did this weekend on hip thrust (205!! ), I got up and did a little strut around the gym. I thought to myself, “WHOA! I just lifted over 200 pounds! !” To put it in context, at this time last year, I was doing the same exercise with about 80lbs. If you had told me last year that I’d do 200lbs on hip thrust, I wouldn’t have believed you. For me, the exercises that make me feel the most invincible are chin ups and bench press. I suppose it’s because they used to seem like exercises only the big beefy guys at the gym could do, not someone five-feet-nothing and banged up from years of rugby. But slowly, steadily, I worked my way up, and now they are my favorites. Tonight I actually had the pleasure of watching someone bench press for the first time. I knew she could do it since she’s gotten crazy strong through her hard work in the gym over the past few months, and watching her push that bar up, and then get up off the bench with a huge smile on her face, totally made my day. I knew exactly how she felt. And it’s not just the confidence that makes lifting great — it’s the level of focus and quiet in your mind you need as you prepare for a lift. When I set up for deadlift and brace my core, I clear out my mind. I’m focusing only on dragging that bar up my body. Same on bench press. Deep breath out. Fingers lined up. Shoulders back. Core braced. Focused. You just can’t let your mind wander when you lift heavy. Your form will suffer, as will your intensity. You need complete focus. ​Which is the complete and total opposite of running, especially distance running. When I was marathon training, I had a lot of time alone with my thoughts out on the road. So much would go through my mind, and often it would start on one thing, like mulling over a recent conversation, and then change to an email I would draft in my head. Sometimes I would find myself getting emotional on a run, as the time to think would make me realize how much something was bothering me, or how grateful I was feeling, or how angry I was at something that I clearly was repressing. Running tends to make me shed the protective layer that keeps me from wearing my heart on my sleeve all the time. While sometimes the emotion can catch me off guard, most of the time it’s complete catharsis. The ability to let your mind wander without any distractions is amazing, and extremely therapeutic. I thought the article in NY magazine did a really good job of explaining it. So I am proud to say that I have equal love for lifting and running. It’s like having two kids who have very different personalities, but you love them both. Love is love, after all, and finding some form of exercise that you truly enjoy is all that matters. When you find two, it’s pretty great.